You will be given a Free reference e-book to read which has 743 pages And the test will be based on that e-book. What is Citrix CCA Certification? Citrix CCA or Citrix Certified Administrator certification refers to a certification usually received by IT associates and professionals which works in validating their core IT implementation capabilities and skills. It works in validating an IT professional's skills in deploying and implementing Citrix solutions and validating the knowledge and skills that are essential in implementing a certain product based on Citrix. It also serves as a validation of a certification holder's ability when it comes to installing, configuring, troubleshooting, administering and maintaining Citrix products and programs that form part of an enterprise environment. Among the most popular Citrix products at present are the XenServer, XenDesktop and XenApp. It should be noted that the Citrix CCA certification test usually covers eleven of the most useful and functional Citrix products including XenDesktop 4, XenApp 5 designed for the Windows Server 2003 version, XenDesktop 5, Netscaler 9, Access Gateway 8, Access Gateway 4 Advanced Edition, Application Firewall 8 and XenApp 6. Fortunately, you are now given the chance to completely understand all products of Citrix with the free Citrix CCA online certification practice course introduced by Brainmeasures to virtually all IT professionals. This free practice course features a free study guide which comprehensively talks about all aspects relevant to passing the Citrix CCA test. Its free practice test is also designed to simulate the actual certification exam so expect to receive adequate guidance when it comes to taking and passing it. 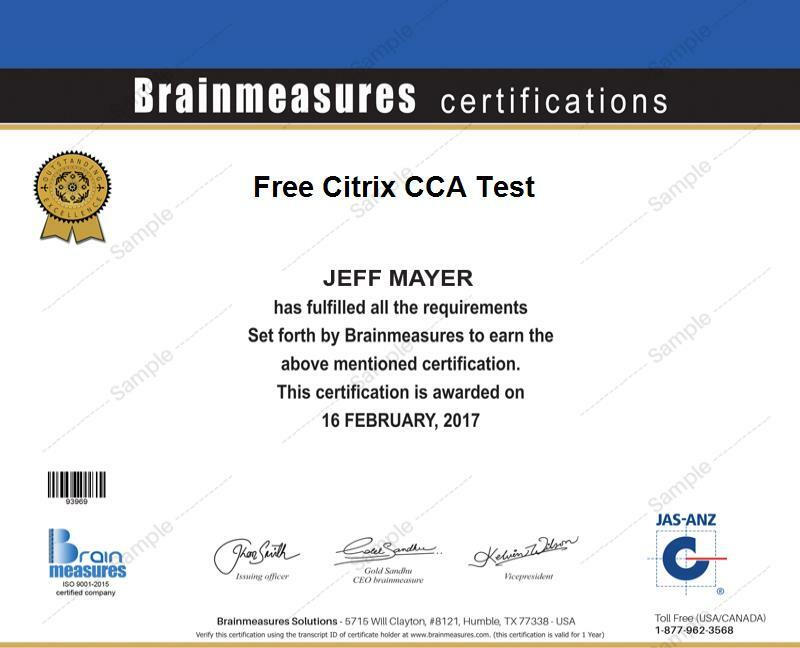 One of the most endearing features of the free Citrix CCA practice course offered by Brainmeasures is its free Citrix CCA test which works in skilfully measuring your ability to pass the actual certification exam. The fact that this is offered for free is a good thing for you especially if you do not want to spend a lot of money making all the exam preparations that you need. Its comprehensive study guide highlights the most relevant topics covered in the test so optimizing the level of your knowledge in the field is greatly possible. You can also use the incorporated free practice test as your instrument towards establishing a good plan that will bring in more success for you when taking the actual certification test. This can guide you in reaching your aim of becoming one of the most successful Citrix certified administrators at present. How to effectively configure the settings for data collector? How to troubleshoot the most common problems faced by Citrix products and optimize performance of applications? How to effectively identify the most appropriate client use? The free Citrix CCA test which is accessible at Brainmeasures can really do a lot of things when it comes to measuring and analysing the level of your knowledge in the field so you can focus more on subject areas that require a lot of your attention. But you should also take note that the test along with the entire practice course works perfectly for lots of aspiring IT professionals including those who want to become efficient Citrix certified administrators, IT associates, systems engineers and computer and IT networking professionals. Passing the Citrix CCA test also entitles you to receive higher annual earnings. With the help of your certificate, you will find it easier to work as an IT and network administrator and receive around $47,000 to $89,000 annually from this position. Working as a Citrix Certified Administrator is also rewarding since it offers approximately $63,000 to $141,000 every year.